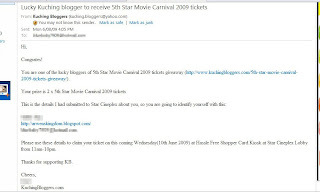 I got this email surprisingly couple days ago and I was so happy, this is my first gift since I join Kuching Blogger. Yeay! 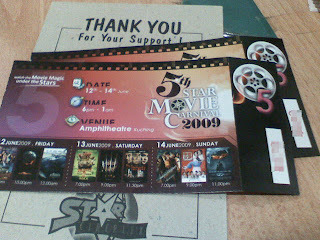 I got two free tickets of 5th Star Movie Carnival 2009! I went to Star Cineplex to claim for it. Thanks KB for the gift and the recommender! It sort of motivation to blog more. Hey folks! Join KB now to get your too.